Self-taught botanist who set out to survey the plants of French Canada. 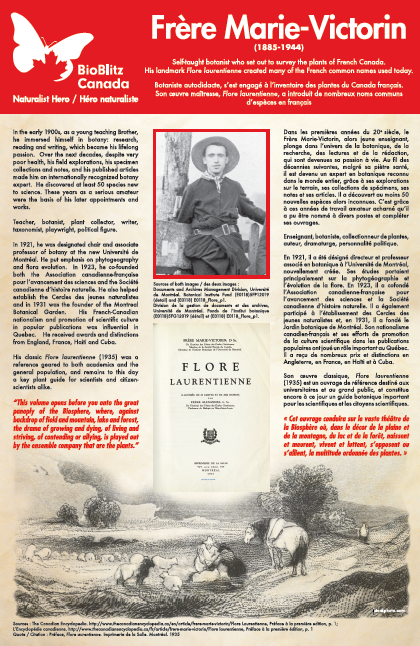 His landmarks Flore laurentienne created many of the French common names used today. In the early 1900's, as a young teaching Brother, he immmersed himself in botany: research, reading and writing, which become his lifelong passion. Over the next decades, despite very poor health, his field explorations, his specimen collections and notes, and his published articles made him an internationally recognized botany expert. He discovered at least 50 species new to science. These years as a serious amateur were the basis of his later appointments and works. View PDF on Frère Marie-Victorin.